Wow! Glass pumpkins in a pumpkin patch--a gorgeous celebration of fall takes place beginning the first Saturday of October Boyer Glassworks, Harbor Springs, and Three Pines Studio, Cross Village, for the Great Lakes Pumpkin Patch and continues through the months of October and November. 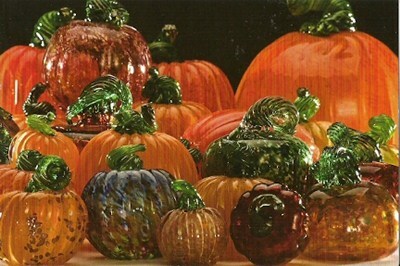 This Northern Michigan annual event is a colorful gathering of hundreds of glass pumpkins by artists Harry Boyer and Lynn Dinning. Harry's pumpkins will be in the patch outside Boyer Glassworks in downtown Harbor Springs and both Lynn's and Harry's pumpkins appear in the garden patch at Three Pines Studios. The combination of these two talented glassblowers is spectacular and the garden settings bring the pumpkins to life. While the pumpkin patch day is October 3, the pumpkins will be on sale throughout the fall at both galleries--or as long as they last! 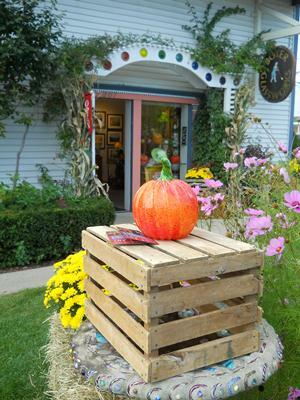 To get the best pumpkins, visiting these two galleries on the Great Lakes Pumpkin Patch day is a must but don't worry; if you miss it, stop in any time. The pumpkins are created in a variety of colors, shapes, and textures. It is a stunning example of fall and artistry!